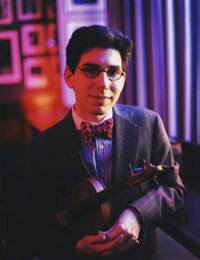 Welcome to the online home of jazz violinist, mandolinist, arranger, and bow-tie rights activist, Aaron Weinstein. I’m delighted that you stopped by my newly refurbished home. Please feel free to take a stroll around. I hope you enjoy your stay and find everything you need. If you’re a good guest I’ll even validate your parking on your way out. Have violin, will travel! I may be performing in a city near you. Take a look at my SCHEDULE page to find out. Learn all ABOUT my musical life: biography, Q & A session, press photo and bio downloads. Listen to my music, walk through my Gallery or visit the Screening Lounge of my MEDIA room. Read the nice PRESS people have written about me & download press-ready copies of my bio and offical photo.